This season is all about the choker neckline - it\'s everywhere, and this retro nineties look is one that we absolutely love. Going out dresses with this style are super easy to wear, as the statement neckline gives it an edge and does all of the work for you. All you need to do it add a pair of stiletto heels and a clutch bag for an instant glam look with an edge. Going out dresses can often be a bit dull - black bodycon dresses get boring after you\'ve worn them for the 100th time. If you\'re looking for a dress that\'s a bit different for the party season, the velour trend could be the one for you. Velour dresses can be dressed up with block heels or knee high boots to create an on-trend party look. 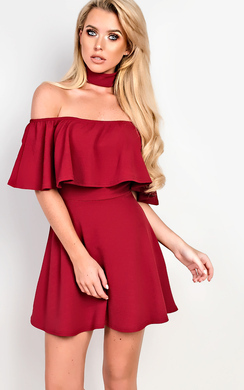 If you\'re looking for something different to add to your collection of going out dresses, try a crushed velour dress with a choker neckline to rock two trends at once. Off shoulder dresses are bang on trend this season, and are both flirty and super feminine- the perfect addition to your wardrobe of going out dresses. We love off shoulder dresses that have flared sleeves, as this creates a nice balance to the exposed neckline. Off shoulder dresses look amazing with a simple necklace and some block heels- don\'t forget to add a clutch bag for a knock out party look. Choose one of each style to build a wardrobe of on-trend going out dresses that will never let you down!